Earning your runs by climbing up before speeding down is a new way to appreciate your surroundings, as well as get a super workout. While just about every skier and rider at Stratton Mountain is whizzing down the hill, a few hardy types are climbing back up. Uphill skiing and hiking are the latest trends in mountain sports, ambitious activities that began in Europe and are becoming more popular on both the East and West Coasts every year. 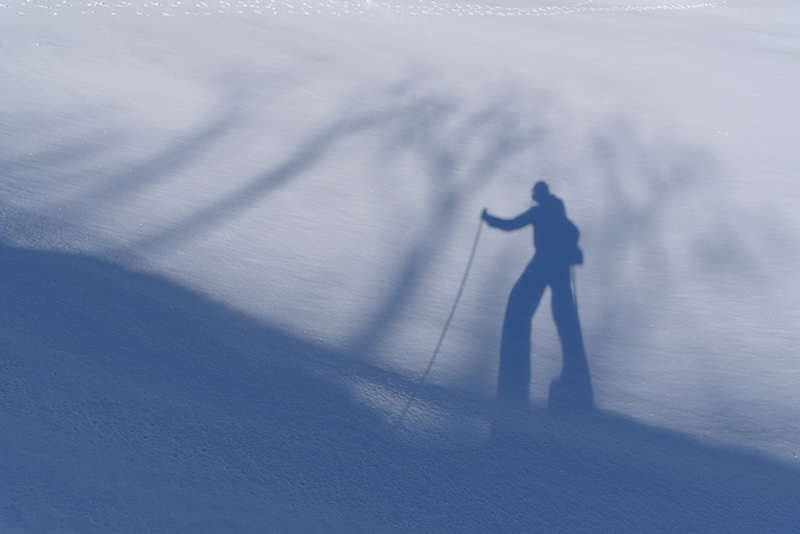 Uphill skiing, also known as skinning, uses special “skins” on the bottom of skis that can both slide on and grip the snow. “Originally they used seal skin,” Kajah explained. 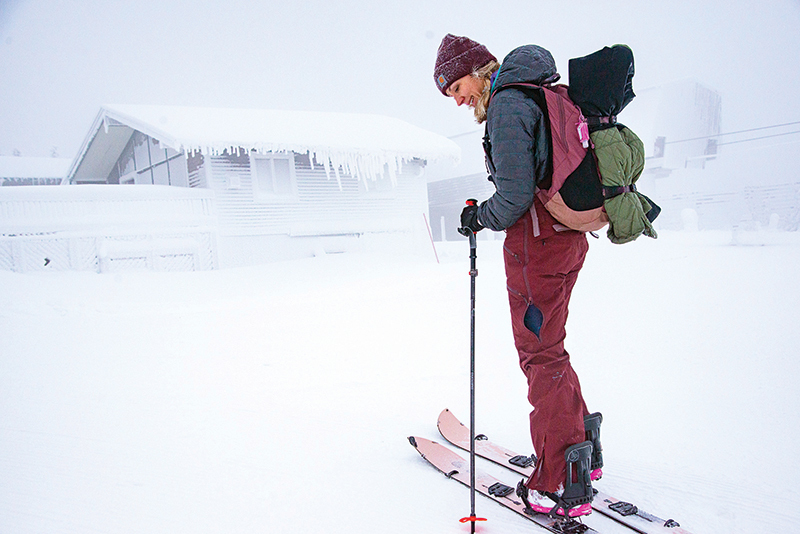 “Now it is a synthetic material, sort of like a lint brush, where all the hairs are going in one direction so you can glide easily uphill but they won’t let you slide backward.” A special type of binding, similar to those on cross-country skis, allows skinners to lift their heels up in the back when they’re going uphill and then to lock them in place when they’re skiing down. 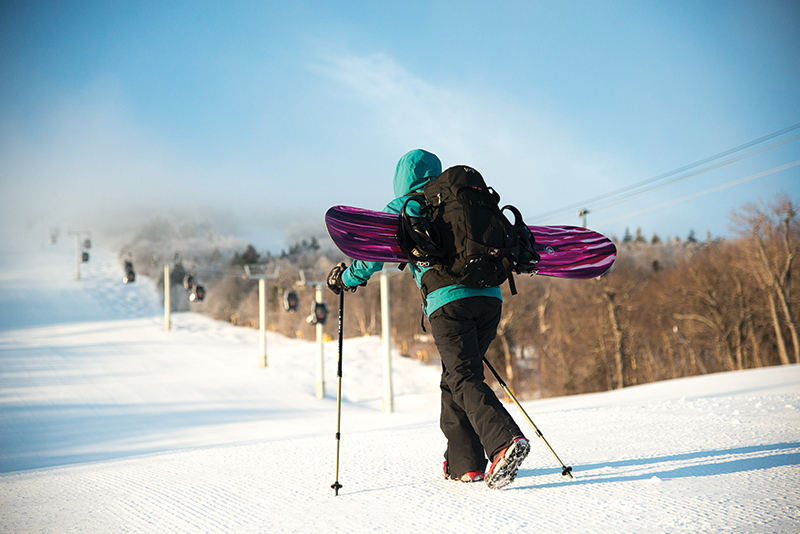 Riders either use snowshoes and carry their snowboards on their backs or they can use a split board. These devices can be separated into two ski-like parts with climbing skins on the bottoms to ascend slopes. The separate parts are then joined together to form a regular snowboard for the trip back down. And when the slopes are a bit icy, the best option for everyone might be mountaineering crampons or ice cleats strapped to boots. 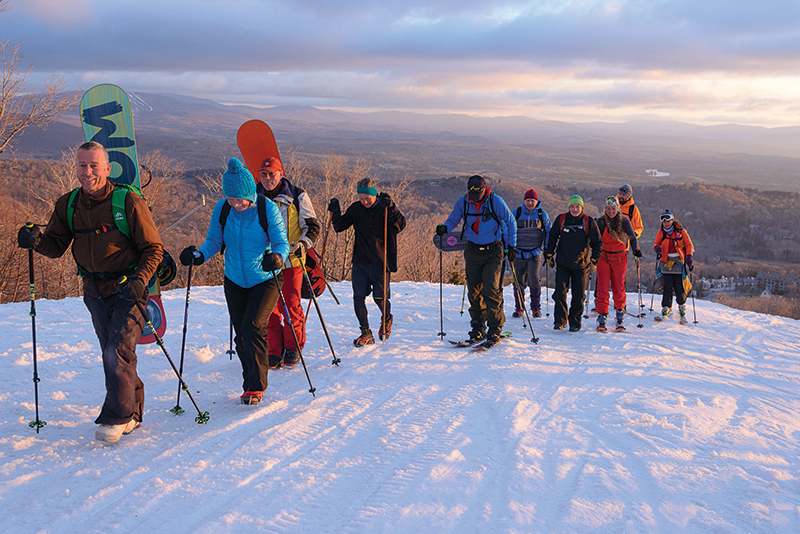 Schriebl, the acclaimed photographer for both Stratton Magazine and Stratton Mountain Resort, may be singularly responsible for bringing the uphill trend to the resort, introducing the sport to dozens of locals and visitors who often join him on his morning trek. “I have inspired a few people; it’s a great thing when it happens,” he said. Schriebl said he is usually joined by a small group of hikers on his regular morning trips up the mountain and has had as many as 20 alongside him for his New Year’s Day climbs. 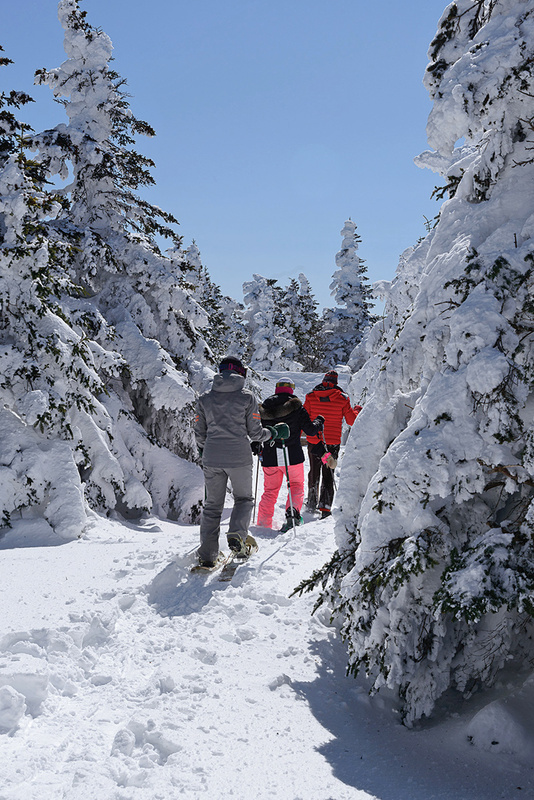 It takes Schriebl and Prescott 45 minutes to an hour to hike the 1,800 feet up Stratton Mountain. “You’re sweating like a hog but it feels so good,” Prescott said. Bringing a change of clothes up the mountain is imperative, climbers say, because you will be soaked when you reach the peak, which would make for a freezing ride down. Fortunately, Stratton built a cozy hut at the summit with snacks and a wood stove where climbers can rest and change in relative comfort. It is called, of course, Hubert Haus. Diehard uphillers will go out in just about any weather, because, they say, that’s part of the challenge. But perhaps the most rewarding part of uphilling is the chance to slow down and savor the ever-changing natural panorama of the mountain. And Schriebl, who has been at it for decades, says every time he climbs it’s a different adventure. “I never get bored; it’s always different, the clouds, the view—it’s never the same,” he said. “You see fantastic sunrises and sunsets. In the winter it’s very dramatic, you have the cold. Outside it’s freezing, inside you’re soaking wet from sweating. I don’t put anything in my ears. I like the sounds. I like the feel of the atmosphere.” And the experience can become addicting. While downhill skiing is a thrilling adrenaline rush, intrepid uphill hikers say the quiet pleasures of ascending the slopes, while everyone else is throwing themselves down, is an incomparable delight for the body and the soul, and the ultimate way to earn your turns. Start slow. You don’t have to make it all the way to the top your first time out. Uphill with a buddy who has experience. Start your trek early to avoid traffic and to get those fresh turns on the way down. 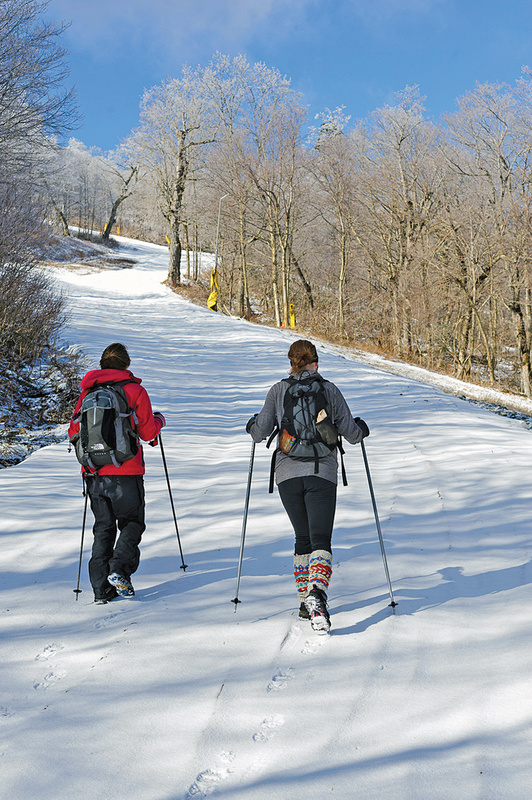 Stick to the uphill trails, which are marked on the Stratton trail map. Travel uphill only during operating hours. Stop only in an area where you are not obstructing a trail, and are visible from above. When hiking, wear a good pair of boots that have ankle support. 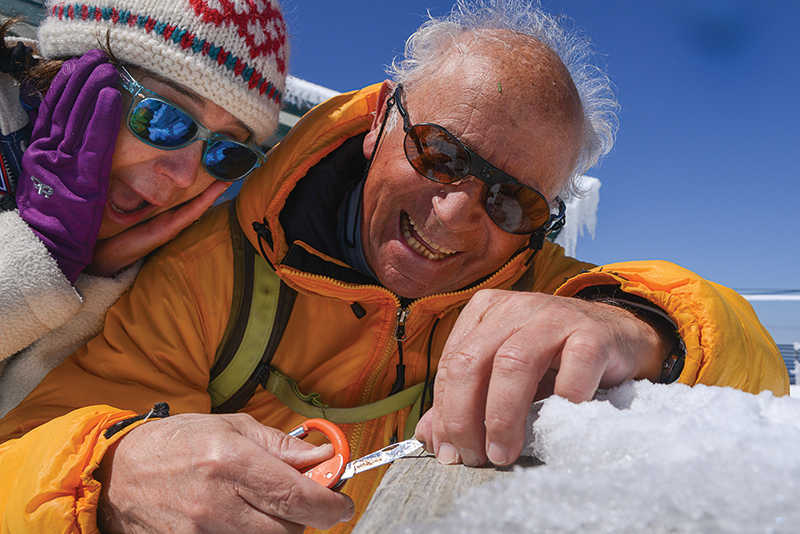 Use telescoping ski poles that can be shortened on the way up and lengthened on the way down. If it is icy, use ice spikes. Bring a change of clothes. Everything you’re wearing will be soaked in sweat when you get to the top. Although you can uphill in any weather, it’s best to avoid the rain.